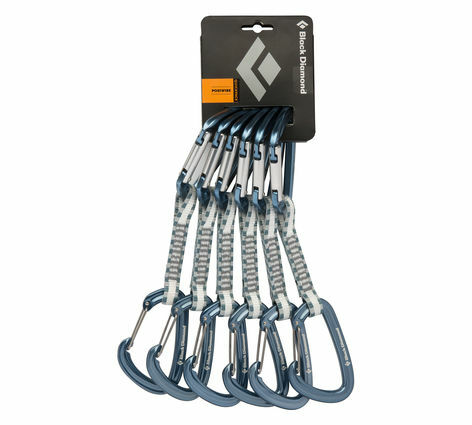 The Black Diamond PosiWire quickdraw is Black Diamond’s most inexpensive climbing draw. The Posiwire is available individually or in “QuickPacks” of six that will save you about five dollars if you buy them at the full retail price of $15 each (keep reading for a better deal). I’ve been using these draws for a few years now and I’m really happy with them. Even though they are one of the cheapest quickdraws they are great for the average climber and haven’t let me down yet. 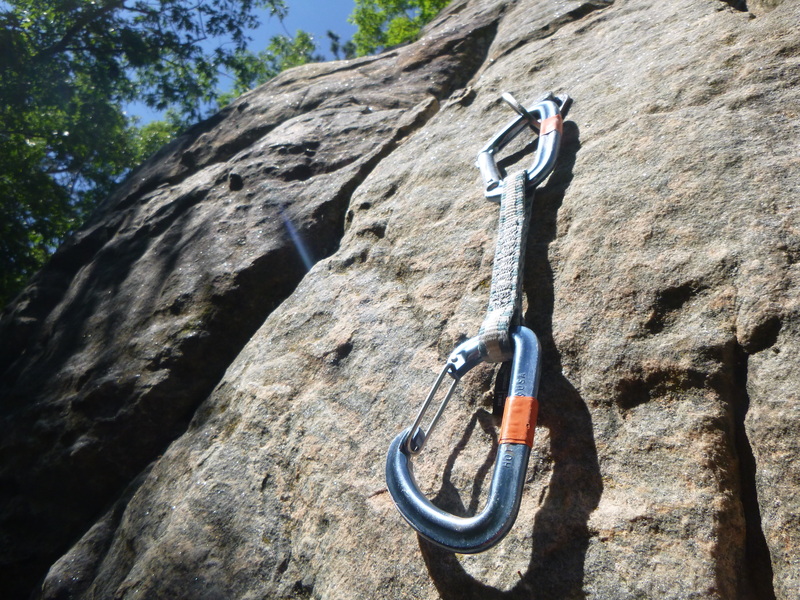 All climbing quickdraws are built from three components: a rope side carabiner, a hanger side carabiner, and a dogbone to connect the two. The PosiWire uses Black Diamond’s HotWire carabiner to clip the rope and Positron carabiner to clip the hanger. The difference between the two is that the HotWire has a wire gate and the Positron has a solid gate. This makes it easy to remember to always use the solid gate ‘biner for the hanger and the other for the rope. The Black Diamond PosiWire is connected by a fairly narrow 14mm (0.6″) dynex dogbone. 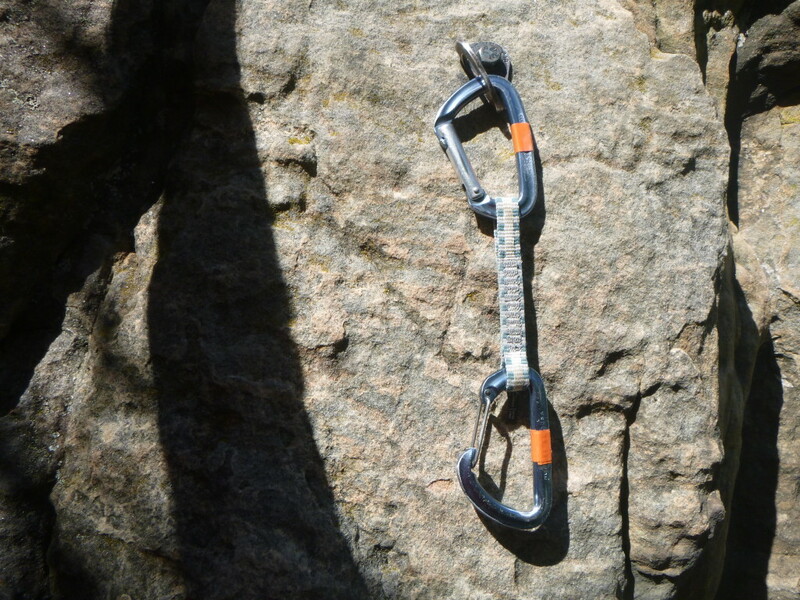 This dogbone includes Black Diamond’s Straitjacket rubber insert to keep the rope side carabiner aligned with the dogbone, making it easier to clip. At 103 g (3.6 oz) in the 12cm version the Black Diamond PosiWire is not the lightest draw out there. The 18cm is 105 g (3.7 oz). 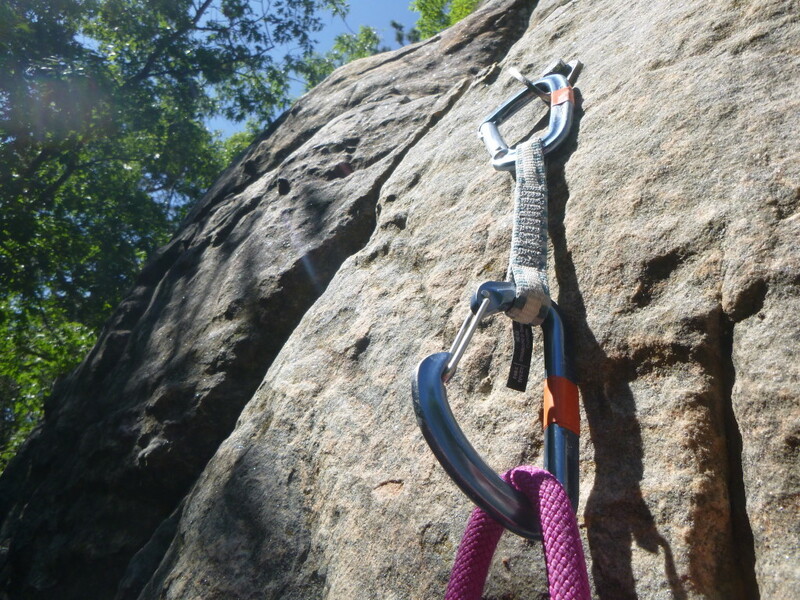 If you’re a new climber or just having fun this won’t be a problem but if you are working at your absolute limit you might want to spend a little more on a lighter rig. The safety guide that Black Diamond provides with the draws is here. It has dos and don’ts for how to use the draws. I’ve been using the PosiWires for a couple of years for general sport climbing and trad climbing, mostly on single pitch routes but also on a few multipitch routes. They are an absolute workhorse and a great value. The Positron carabiner is easy to clip to the hanger (and later remove) due to the keylock nose. The wire gate on the other end eliminates gate flutter and clips smoothly to the rope even when you’re pumped. 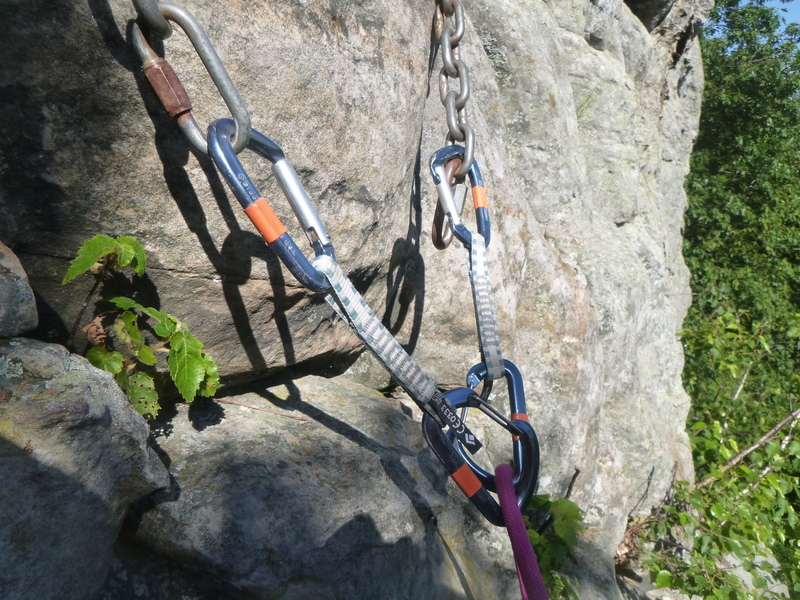 Some customer reviews note that the wire gate ‘biner caused trouble when unclipping the rope on overhanging routes. I haven’t noticed this problem but if you climb a lot of very steep sport routes you might want to consider a draw with hooded or keylock carabiner to prevent this from happening. II marked my draws with electrical tape so they are easily identifiable. All in all the Black Diamond PosiWire is a great value climbing draw that I can recommend for most climbers on most routes. They do have some negatives: they are heavier than more expensive draws, the dogbone isn’t very stiff, and the rope end carabiner isn’t keylock or hooded like some more expensive draws. These negatives are outweighed by the positives: they are cheap, reliable, easy to use, and Black Diamond quality making them one of the best quickdraws available for the average climber. Buy them, mark them as yours, and climb on them with no regrets. Looking for a deal? Amazon usually sells the Black Diamond PosiWire QuickPack of six draws for only $65 , $20 less than buying direct from Black Diamond or from other retailers. A PosiWire draw with rope hung. 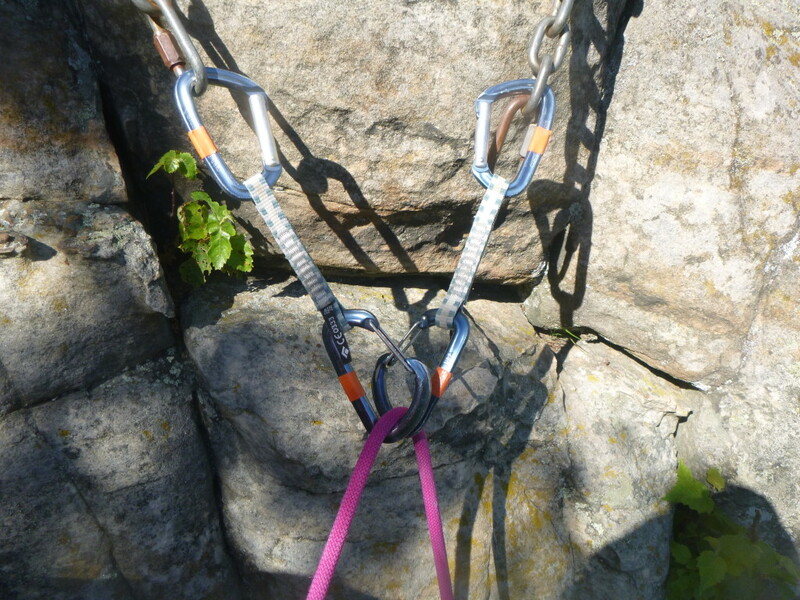 PosiWire draws used as an anchor on Warm Up 2 at Qual Wall in Governor Dodge State Park, Wisconsin. The same anchor but from the side.